Well it’s December 1st and that means as of today the last of the CRTC Let’s Talk TV proceedings rulings come into effect. That means that as of today all of Canada’s cable companies as per CRTC’s rulings (link) must offer channels a la carte. Will the cable companies embrace this new world or will it be another skinny package scenario all over again? So we decided to check in on the options. We reached out to two of the major cable companies and see how much it would cost us to get only HBO. According to the new CRTC rules it should be simple, right? Unfortunately, when we contacted Rogers we were told the following. 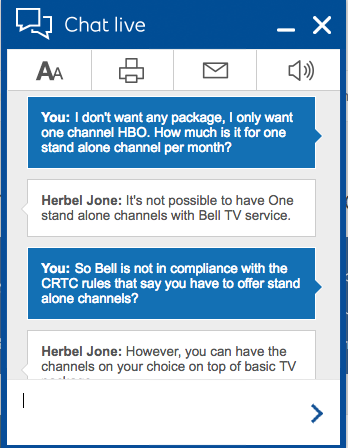 When we contacted Bell we got a similar answer. Ultimately if you want HBO only it seems you still have to pay for things you don’t want or need. $57.93 (plus taxes) per month with Rogers and $64.97 (plus taxes) per month with Bell. That also means you have to get a bunch of other channels you may not want. Does this seem like a great deal? Meanwhile here is how much I as a cordcutter pay for HBO. I bought my Apple TV back in January of this year which was a $200 one time fee. HBO Now’s streaming service is $14.99 (US) per month, so about $20 Canadian depending on the current exchange rate and here is the real bonus. I only subscribe to it for about 5 months of the year. Really only when a show or shows I want to watch is on. We are big HBO viewers in our household (Game of Thrones, Westworld, John Oliver, Bill Maher, Girls, Veep, Silicon Valley). I don’t need to ever call the cable company to turn the channel off or on , I also don’t need to return hardware. I also can watch it on any device in my house. The service has every single episode of every show HBO has ever produced on demand and the episodes are available on demand to watch at the same time they are broadcast live. 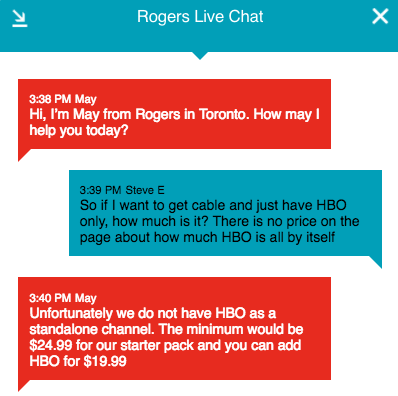 I highly doubt you can call and cancel HBO very easily with Bell or Rogers anytime you want, and then what would I do with their hardware when I don’t want the channel anymore? So my choices with cable are, I can pay $695.16 (plus taxes) a year with Rogers or $779.64 (plus taxes) a year with Bell for HBO. On the other hand HBO with my Apple TV will cost me $300 for the 5 months which includes the cost of my Apple TV for year one. Next year it will only cost me $100 for 5 months of HBO. That leaves me a savings of $400 this year and $600 next year, all of which I can use to subscribe to other services if I choose. This is the real power of being a cord cutter. This is what true pick and pay looks like and why we love helping Canadians every day.